Foul-smelling air, soot pouring out of smoke stacks, and a blinding fog of pollution. 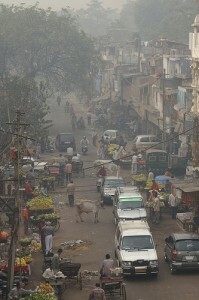 That’s how EDF columnist Dominique Browning found Delhi when she visited and witnessed for herself the environmental challenges India, ranked the seventh most environmentally hazardous country in the world, is facing. But with such vivid exposure to pollution in the country, she turned to EDF’s India Program Director, Richie Ahuja, for context. Richie was born in Agra, home to the Taj Majal, whose pollution-yellowed white marble prompted the Indian Supreme Court in the late 1990s to order 200 nearby factories to stop using coal fuel. Read more from Browning about her visit to India, EDF’s work to address global warming there, and how her trip made tangible the benefits of the U.S. Clean Air Act at home in her post Fast-growing India Confronts Pollution. You can also read more about EDF’s work with partners to help rural households switch from traditional, polluting wood-fired stoves, to cleaner, methane-burning cook stoves in Jennifer Haverkamp‘s post Picturing low-carbon development: Methane cook stoves in rural India. This entry was posted in India, Other. Bookmark the permalink. Trackbacks are closed, but you can post a comment.